The Vice President of India, Shri M. Venkaiah Naidu has said that Gandhiji's thoughts and actions are relevant even today. He was addressing the gathering after giving away the International Gandhi Award 2017 to Dr. M.D. Gupte for his outstanding contribution to the global programme of elimination of leprosy and Dr. Atul Shah for humanitarian services to alleviate the suffering of leprosy - affected persons, organized by the Gandhi Memorial Leprosy Foundation, in Sewagram, Wardha, Maharashtra today. The Minister for Energy and State Excise, Maharashtra, Shri Chandrashekar Bawankule and other dignitaries were present on the occasion.The Vice President said that leprosy is a disease that has been prevalent in our country since a very long time. He further said that lack of knowledge and treatment together with the visible deformities which leprosy caused has made this a dreaded disease. 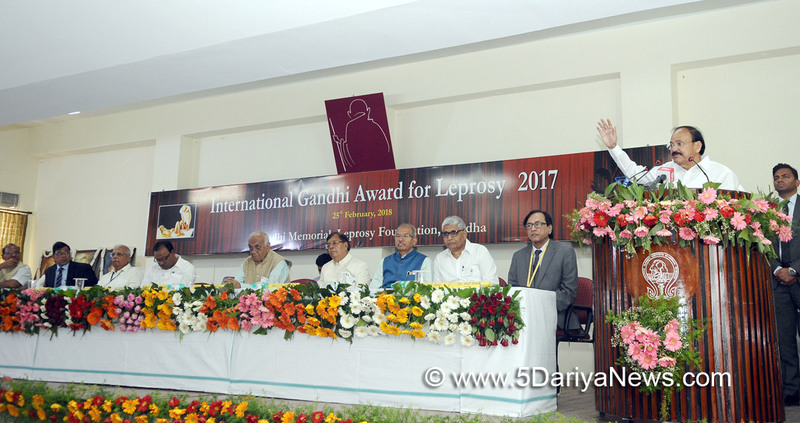 There is a lot of fear, superstition and stigma attached to leprosy, he added.The Vice President said that Gandhiji took keen interest in leprosy patients and leprosy work even in those days when there was no specific cure for leprosy. He further said that the need of the hour is to intensify our efforts towards early detection of leprosy cases, provide equitable access to appropriate treatment and provide integrated leprosy services. There is need to empower those who have been socially discriminated through advocacy and information dissemination, he added. The Vice President quoted Gandhiji as saying – “We need to preserve the multi cultural nature of our country and the world. I do not want my house to be walled in on all sides and my windows to be stuffed. I want the cultures of all lands to be blown about my house as friendly as possible. But I refuse to be blown off my feet.”The Vice President said that over the years, the scourge of leprosy has remained a blot on humanity. He further said that more than the medical condition, the social stigma attached to the disease is a cause for concern. Ignorance about the treatability of the disease coupled with perpetuation of myths often leads to ostracism of persons afflicted with leprosy, which causes considerable distress in persons suffering from the disease, he added.The Vice President said that health care workers need to remain aware of the possible diagnosis of leprosy in patients presenting with skin lesions or sensory change. He further said that those in primary health care, as well as specialist services need to be aware and trained in the diagnosis and management of leprosy. There is also a need to conduct research on the development of diagnostic tests and new vaccines, he added.The Vice President said that awareness in the community in general is also essential to promote early case detection. He further said that approaches to reducing stigma are important to prevent patients from hiding the diagnosis. Prevention of disability in those with nerve function impairment and rehabilitation within the community are important challenges, he added.